Attractive solutions to tricky repair jobs! Make custom repair cauls, magnetize pickups, and more. See the video for tips! As guitar repairman Dan Erlewine has discovered, "magnets are tools and they have lots of uses!" Repair shops are constantly finding inventive new ways to use them. For example, magnets can be attached to (or inlaid in) clamping cauls for easy alignment with steel clamp jaws—a great help when aligning patches for repairing cracks, or when regluing a bridge. An exterior magnet will move a second magnet inside a guitar where your arm can't reach: wrap the inner one in a damp cloth to clean glue squeeze-out, or attach self-adhesive sandpaper to remove dried glue. For building or repairing guitar pickups, you can use a 1" pair to magnetize a pickup or change its polarity. Single-coil Kit Instructions tell you how. This versatile little kit contains two 1/2" (12.70mm) and two 1" (25.40mm) round nickel-plated magnets. Each is 1/8" (3.18mm) thick, with a center mounting hole that's countersunk on both sides for handy attachment to clamping cauls. Also included are two Magnet Handles that make picking up, positioning and separating these powerful magnets a whole lot easier. Based on an idea by Al Rorick in our R&D shop, they're made of knurled brass, 1-3/16" long, with attachment screw. Each handle holds one or two magnets, as needed. Here's a tip: Always use protective paper on the outside of a guitar when sliding a magnet over it. Warning: These are seriously strong magnets, made of rare earth neodymium boride. The Guinness Book of Records lists this as the world's most magnetic substance, ten times stronger than the ceramic magnets used in modern loudspeakers. These magnets can degauss, magnetize or repolarize any ferrous or magnetic material, including guitar pickups! Keep them away from magnetic storage media such as computer discs, audio and videotapes, as well as pacemakers, computers, CRTs, TVs and watches. KEEP OUT OF REACH OF CHILDREN. If magnets are swallowed, they can attach to each other and cause internal injury. These powerful Guitar Repair Magnets can serve a number of different functions in the shop. By John from Sistersville, W.V. Awesome little magnets. Very strong. Be careful, when I put the handles on the 1” magnets to try them out the attraction was so strong they slammed together with enough force to actually break. No fault of the magnets, they are just incredibly strong. Stewart MacDonald’s customer service is head and shoulders above anybody out there. Just simply the best, thanks guys. My lutherie mentor showed me these and I've found a number of uses including holding a cracked flattop top flat (say that fast three times!) while being clamped from the sides. all the excess fibers end up in a nice clump of fuzziness that's easily removed and discarded. I bought this set to try and thin the inside of a tenor guitar that I made with the top a little too thick. The magnets weren't strong enough to pull even a small piece of sandpaper through the top. My own fault but not the right tool for that job. 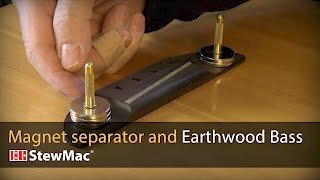 We're very sorry the StewMac Guitar Repair Magnet Set wasn't right for your project. If you would like to speak with our Customer Support Team about a refund for this product, feel free to give us a call at 1-800-848-2273. We look forward to helping you with this. We're very sorry the Miter Box wasn't right for your project. I bought those for magnetizing pickup polepieces. I built a sliding jig, like a small drawer, to be able to slip the assembled pickup between the magnets, and it works like a wonder. In quantities, they should serve as clamps (Specially for acoustic guitar repairs). They can be stacked for concentrating "power" in the same spot. It'd be nice to have clear markings for south and north in the pieces. This product is great. I use the magnets for all kinds of workshop tasks. Not just guitar building. Terrific, though plating peels off rather quickly. They're great for cleating, gluing braces, aligning and gluing cracks -- amazingly effective and a cinch to use if you get 'em WITH the handles! However, the chromium plating began peeling on mine after several uses, leaving exposed edges. These can scratch the finish of the guitar if you're not careful! I smooth-sanded the magnet to get rid of all particles of the chromium, and I always put tape or wax paper between the finish and the magnet. I use them almost every day in the workshop : a must have ! The magnets are great. We use them to fasten GPS tracker/modems to earth moving equipment.